An excellent Huari polychrome jar from Peru, ca. 650 – 800 AD. It is 4-1/8” in diameter and is decorated with two stylized representations of a zoomorphic deity, separated by chevron design panels. Intact, with vivid, highly burnished paint and good mineral deposits. An excellent Nazca jar from Peru, ca. 200 – 400 AD. This beautiful polychrome vessel with flared rim is 4-1/2” in diameter and depicts a series of the “tied bags”, which are believed to contain a shaman’s paraphernalia, a rare motif. Intact, with vivid paint and good mineral deposits. Cf. Proulx “Sourcebook of Nasca Iconography”, page 175. A lovely Chavin stone bowl or mortar from Peru, ca. 1200 – 200 BC. 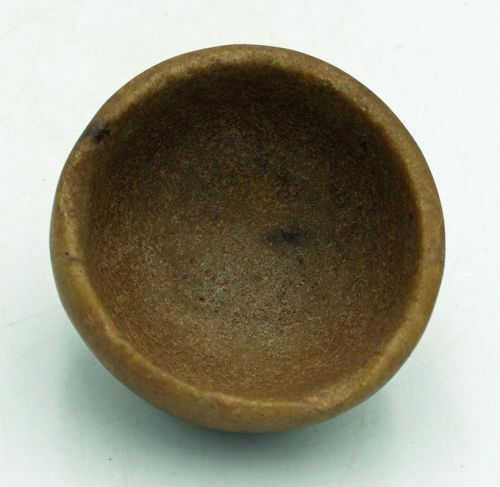 This choice example is 2-7/8” in diameter and is carved from fine-grained, light brown stone. Beautifully polished and extensively used. Good mineral deposits. A gorgeous Mixtec-Aztec molcajete from Mexico, ca. 1300 – 1400 AD. This lovely tripod grinding bowl is 7-1/8” in diameter and features a pair of stylized jaguars surrounding the grinding surface. The trio of legs are executed as paws and the exterior of the bowl is decorated with a variety of symbols painted in white over the red slip. In excellent condition. A rare Nariño basket bowl from Colombia, ca. 850 – 1500 AD. This choice example from the Capuli cultural complex is 6-1/2” high and has a large strap handle. It is decorated with the negative resist painted designs characteristic of this type. In excellent condition, with good mineral deposits on the highly burnished slip. An enormous Tairona greenstone necklace from Colombia, ca. 1000 – 1500 AD. It is 40” long and is made from nicely polished chrysocolla tubes, the largest of which is 2-1/2” long. Beautifully colored stone. A lovely Colima figure from West Mexico, ca. 300 BC – 300 AD. This fine standing female is 4-3/4” high and is posed with hands held to her chest. She is standing on bifurcated feet and is wearing a long skirt and a head band. In perfect condition, with strong mineral deposits on the highly burnished slip. An adorable Colima maternal figure from West Mexico, ca. 300 BC – 300 AD. It is 3-3/4” high and depicts the mother cradling an infant in her lap. Both are adorned with identical headdresses. Intact, with good mineral deposits and root marks. A matched pair of Lambayeque (Sican) miniature sandals from Peru, ca. 700 – 1300 AD. They are 1” long, made from silver with touches of gilding. Wonderful examples of an important funerary offering. An excellent Tumaco-LaTolita grinder from southwest coastal Colombia, ca. 300 BC – 300 AD. This ceremonial grinder is 10-5/8” long and was most likely used during manioc rituals. This large example is intact, with traces of red pigment and strong mineral deposits. Labbe “Colombia Before Columbus”, page 66. A rare figural metate from Costa Rica, ca. 500 – 1500 AD. This well-used example is 11” long and depicts a crouching human form, with hands holding the head and supporting the grinding platform as its body. A trio of trophy heads decorates each side. In excellent condition. A fine Moche IV stirrup vessel from Peru, ca. 450 - 550 AD. It is 9-1/2" high and is decorated with a bean motif covering a little more than half the chamber. The Moche used such ideographic designs to communicate messages. The stirrup is decorated with a serpent, as well as a Cereus cactus. Vivid paint, good mineral deposits. Cf. Larco Hoyle "Los Mochicas I", page 164. A fine Chimu orangeware bottle from Peru, ca. 1100 – 1450 AD. It is 7-1/2” high and is decorated with a band of recurved step fret designs, combining agricultural terraces and wave designs into a fertility motif. A step adorno decorates the spout. Highly burnished, good mineral deposits, with trails etched into the firing cloud. Cf. "The Olmec World", page 305.